Jabberwocky is a 'nonsense poem' written by Lewis Carroll in his 1871 novel Through the Looking-Glass. All the same, it does strangely make a kind of sense. 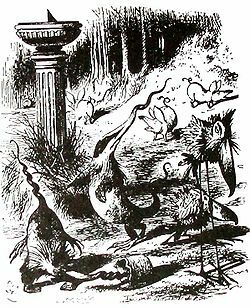 In an early scene Alice in wonderland finds the verse Jabberwocky. She says (p24) "Somehow it seems to fill my head with ideas—only I don't exactly know what they are". This is now thought to be one of the greatest nonsense poems written in English. Its playful, whimsical language has given us nonsense words and neologisms such as "galumphing" and "chortle". The concept of nonsense verse was not original to Carroll. Nonsense existed in Shakespeare's work and was well known in the Brothers Grimm's fairytales, some of which are called lying tales or lügenmärchen. John Tenniel reluctantly agreed to illustrate the book in 1871, and his illustrations are still the defining images of the poem. The illustration of the Jabberwock may reflect the Victorian obsession with natural history and the fast-evolving sciences of palaeontology and geology. The works of Darwin and the models of dinosaurs at the Crystal Palace Exhibition helped feed the interest. Perhaps it is not so surprising that Tenniel gave the Jabberwock "the leathery wings of a pterodactyl and the long scaly neck and tail of a sauropod". In Through the Looking-Glass, the character of Humpty Dumpty explains to her the nonsense words from the first stanza of the poem. However, Carroll's personal commentary on several of the words differ from Humpty's. An analysis of the poem and Carroll's commentary is given in the book The Annotated Alice by Martin Gardner. ↑ Gardner, Martin (1999). The Annotated Alice: the definitive edition. New York, NY: W.W. Norton and Company. Few would dispute that Jabberwocky is the greatest of all nonsense poems in English. ↑ Rundus, Raymond J. (October 1967). ""O Frabjous Day! ": Introducing Poetry". The English Journal (National Council of Teachers of English) 56 (7): 958–963. doi:10.2307/812632.